The Heidi Chronicles, now playing at the Young Centre for the Performing Arts, is a sweet, nostalgic rendering of an American woman’s personal, political, and cultural coming-of-age through through a twenty year period. The show follows the journey of the titular Heidi Holland as she constructs an identity alongside the momentous changes that came with the onset of second-wave feminism and the sexual revolution. 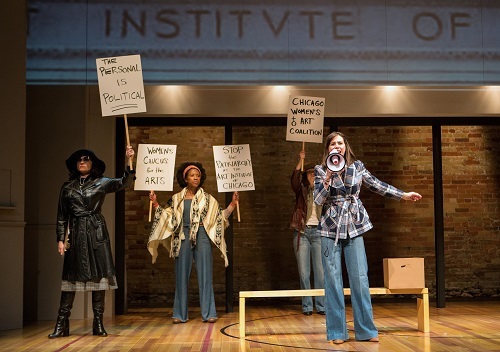 As explained in the program notes, The Heidi Chronicles was “hailed as a pioneering feminist play” and a “breakthrough” when it first premiered in 1988 and fittingly won playwright Wendy Wasserstein the Tony and the Pulitzer. However, 30 years later, it now serves as more of a “reminder” of “the funny and infallible pioneers who blazed the trail for us,” and perhaps this is reason why my guest and I felt a distinct lack of enthusiasm after the performance. Don’t get me wrong, the production was certainly enjoyable, but the consequence of time has made The Heidi Chronicles feel less fresh to the eyes of women who are currently wading their way through a new wave of feminism. While watching the exploits of Heidi Holland, I could not help but muse on how the feminist awakening of a successful, white, straight, thin, cis-gendered American woman is no longer the universal rallying cry it seemingly used to be. Second-wave feminism may have made many gains but its discourse has been persistently criticized for its exclusionary nature and lack of intersectional awareness. This was rendered starkly apparent with one look at the predominantly-white casting. However, this is where I must admit my own limitations as a reviewer, as there were many times where I couldn’t tell whether the production was trying to play it straight or cheekily satirize now-common stylistic tropes. In The Heidi Chronicles, every male love interest is infuriatingly witty and/or attractively arrogant with a heart of gold, first kisses are given under the sultry glow of streetlamps, women’s conversations primarily revolve around their relationships with men, and almost everyone ends up, if not happy, then at least financially secure. That’s not to say there wasn’t anything novel about the production. I especially enjoyed watching the various displays of female friendship throughout the show. A sisterhood of women hugging and holding hands with one another is still all too rare a sight onstage. Unfortunately, Heidi still ends up spending a fair bit of time judging her friends and lamenting the lack of feminist camaraderie once she becomes aware of the growing conservatism that comes with age. But maybe my disappointment in this predictable turn of events is because I made the mistake of trying to pin-point exactly what everyone was trying to say, as if art is ever really that simple. Maybe, as my companion challenged me, what I saw as mixed messages were actually a demonstration of more complex truths: life is complicated and confusing and there will always be people who will disappoint us, but despite all this disappointment and loneliness and frustration, there is still the possibility of love and renewal. In any case, the play benefited from a number of great performances, chiefly among them Michelle Monteith as Heidi. Monteith moves through Heidi’s various ages with just as much ease as she does all of Heidi’s idiosyncrasies. She has especially strong chemistry with Damien Atkins as her best friend Peter Patrone, and the scene where Peter calls Heidi out on her lack of support during the AIDS epidemic is one of the most touching moments in the play. As well, fantastic design work was done by Erika Connor on costumes and Verne Good on sound. It’s not easy to take an entire audience through two decades and, based on the amount of nods I saw in the theatre whenever the sights and sounds of a new scene appeared, the production team did it with aplomb. Although The Heidi Chronicles has lost the sheen of innovation it once had thanks to shows like Mad Men or Gilmore Girls, it still stands up as a thoughtful, heartfelt reminder of how far we’ve come and how far we still have to go. Here’s hoping Soulpepper will release a soundtrack or playlist for our nostalgic pleasure. The Heidi Chronicles is playing until June 18th at the Young Centre for the Performing Arts in the Distillery Historic District (50 Tank House Lane). Please check the Soulpepper Season Calendar for specific dates and times. The show runs for approximately 2 hours and 20 minutes. There is one 20 min intermission. Ticket are $25 -$96 and are available online at youngcentre.ca or www.stageplay.ca (for 30 and under), by calling the Box Office at 416.866.8666, or in person. The Box Office is located in the atrium of the Young Centre for the Performing Arts, and is open Tuesday to Saturday from 1 – 8pm and two hours prior to a Sunday or Monday performance. Photo of Raquel Duffy, Sophia Walker, Laura Condlln & Michelle Monteith by Cylla von Tiedemann.